Pachmarhi (Hindi: पचमड़ी) is a hill station in Madhya Pradesh state of central India, also known for the Pachmarhi Cantonment. It is widely known as "Satpura ki Rani" (Queen of Satpura), situated at a height of 1000 m in a valley of the Satpura Range Hosangabad district. The highest point in the central India region and the Vindhya and Satpura range; Dhupgarh at 1100 m is located here. 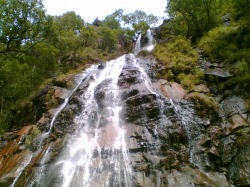 The Bee Fall is the most accessible of all waterfalls in Pachmarhi. It's a high fall with very strong current. By the time water is midway to the ground it breaks into million stinging drops and gives it the name. The caves of Ellora constitute one of the most beautiful expressions of the art of the Indian Middle Ages, and are designated as a UNESCO World Heritage Site. Situated outside the city of Aurangabad, 400km northeast from Bombay, it was created between AD 350 and 1000 by Buddhists, Hindus and Jains who laboured to sculpt temples from the living rock. These breathtaking caves are remarkable for their sculptures and architecture. Some areas of Rajasthan, like the Dhar, are deep deserts. Built in 1799, the Hawa Mahal, or Palace of the Winds, is one of the major landmarks of Jaipur. This five storey building, which looks out over the main street of the old city, is a stunning example of Rajput artistry, with its pink semi octagonal and delicately honeycombed sandstone windows. It was originally built to enable ladies of the royal household, to watch the everyday life and processions of the city. The palace was built by Maharaja Sawai Pratap Singh, and is part of the City Palace complex. Khajuraho, a quiet village in the central state of Madhya Pradesh, is home to one of India's major attractions - the superb temples of Indo-Aryan architecture. These temples were built during the Chandella period, a dynasty which survived for five centuries before falling to the onslaught of Islam. Khajuraho's temples, almost all, date from one century long burst of creative genius from 950-1050 AD. In the days when most visitors came to India by ship and when Bombay was India's principal port, this was indeed the 'gateway' to India. Today it's merely Bombay's principal landmark. The gateway was conceived following the visit of King George V in 1911 and officially opened in 1924. An extravagant marble monument of love, built by Shahjahan in 1653 as a memorial to his queen Mumtaz Mahal who died giving birth to their 14th child. White marble and red sandstone, silver and gold, carenelian and jasper, moonstone and jade, lapiz lazuli and coral were fashioned by 20, 000 skilled workers to make the emperor's dream a reality. It took 22 years to complete - a poignant symbol of eternal love where Shahjahan too lies buried, reunited at last with his beloved Mumtaz. Architecture of the Taj Mahal It took 20,000 workmen twenty-two years (6132-1654) to build this marvel of a marble tomb. Ustad Isa, a Persian architect is said to have been the main designer of the Taj. Many others have figured as designers and craftsmen for the Taj Mahal: Geronimo Veroneo the venetian goldsmith; the silversmith Austin of Bordeaux, the Persians Ustad Ahmad and Ustad Hamid and so on. But the biggest influence was Shah Jahan himself. The design of the monument is impressive: dating to the Omayyad Mosque in Damascus,the Tomb of Timur Lane (Gur Amir) at Samarkhand, to the relatively more recent Humayun�s and Khan Khanan�s tombs in Delhi. A common perception of progression through the landscape led the builders to a scheme of a traditional `char bagh�, a lucid Islamic composition of frames and closures, of walls concealing and gates revealing in a delicate balance of water, land and sky. Kullu in Himachal Pradesh India, the valley of the gods, is a small town famous for its temples, apple orchards, and the annual Dussehra festival, which pulls a horde of tourists annually. The other major attractions in the valley are the majestic Himalayan ranges and the Beas River. Kullu is also renowned for its handicrafts. One of the most beautiful hill stations of the country, Manali is a small town in the Kullu valley of Himachal Pradesh. As the cradle of Himalayas, Manali is quite popular with the tourists for its virgin natural beauty. The trek to Chandratal the " Moon Lake" is almost like going to the moon. You almost feel like the first explorers going to a new place for the first time. Chandra Tal Lake is situated at a height of 4300 m and 6 kms away from the Kunzum Pass in Spiti and Lahaul district of Himachal Pradesh India. 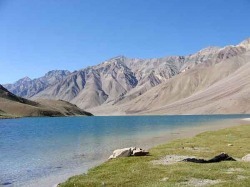 Boasting of a circumference of about 2.5 kms, the deep blue-water of Chandra Tal Lake is the source of the Chandra river. The Chandratal lake, once a halting place for traders who went to Spiti and the Kullu valley from Tibet and Ladakh attracts a large number of adventure lovers. Goa is the perfect place where you will find a blend of traditional and modern aspects of life. On one hand you have plush beaches and on the other hand you have the most natural landscapes that make you wonder if time ever touched this place. Goa is the perfect place to go on a sightseeing tour. These tours will truly show you an entirely new side of Goa that is sure to take you by surprise. The waterfalls, the forests, the spice farms, all are unique in their own way and are a must visit on your tour to india in Goa. Check our related sections for further information. It is one of the oldest and the most spacious of all the mosques in Kashmir, situated in the heart of the city. Just a walking distance from the Makhdoom Sahib is the Friday mosque - The Jama Masjid. It is one of the important mosques in Srinagar at which thousands of people congregate for the Friday prayers. The foundation of the mosque, an architectural wonder was laid by Sultan Sikander in 1398 A.D. and later enlarged by his son, Zain-ul-Abidin, it is a best example of cross-cultural fertilization of the culture of Kashmir. Destroyed thrice by fire and rebuilt each time, the mosque, as it now stands, was repaired during the period of Maharaja Pratap Singh. The area of the mosque is 384ftX381ft. Spacious enough for over thirty thousand people to offer prayers at a time. Of imposing proportions, the mosque is built around a courtyard and is supported by 370 wooden pillars. Its architecture is not purely of Islamic style but decorated with tall pyramid-shaped pagoda-type towers that dominate the landscape of Srinagar. Spread over an area of 141 sq. km., Dachigam National Park is the best getaway for all animal and nature lovers. Situated just 22 km from Srinagar, the park is not only rich in flora and fauna but also turns out to be great bird watching spot. The park was declared a National Park in the year 1981 and now a protected area under the guidance of Forest Department, Government of Jammu & Kashmir. The park has been divided into two sectors, the Lower Dachigam and the Upper Dachigam. The altitude difference between the lower and upper section is quite prominent which makes the climate drastically different. The place is also great for spotting beautiful birds of more than 150 species. The park remains closed between January and April and the best time to visit this park is May to August for Upper Dachigam and September to December for Lower Dachigam. Pahalgam is located at an altitude of 2,130 m, on the southern slope of the Great Himalayas, situated at the confluence of the streams flowing from Sheshnag Lake to the Lidder River and is 96 kms from Srinagar city. Lord Shiva is believed to be a living God by Hindus. According to legends, Shiva recounted to Parvati the secret of creation in a cave in Amarnath. But unknowingly, a pair of mating drops doves eavesdropped on this conversation having learned the secret, is reborn again and again, and has made the cave their eternal abode. Many pilgrims report seeing the doves pair when they trek the arduous route to pay obeisance before the ice-lingam. Amarnath Yatra is a popular event organized by the Jammu & Kashmir state Government in the month of July and August. The pilgrims are allowed to perform darshan from Ashard Purnimashi to Shravan Purnimashi (in Hindu calendar). Situated at a narrow valley, Amarnath stands at 3888 mtrs and 46 kms from Pahalgam and 141 kms from Srinagar. It is advisable to start your journey from Chandanwari and cover the distance to Amarnath and back within five days. Pahalgam is the base to several treks to Kishtwar and the Suru Valley and for the pilgrimage to the holy cave of Amarnath. Chandanwari, 16 kms from Pahalgam, is the starting point of the yatra that takes place every year in the month of Sawan (July to August). The road from Pahalgam to Chandanwari is on fairly flat terrain and can be undertaken by car. From Chandanwari onwards the track becomes much steeper, and is accessible on foot or by pony. About 11 kms from Chandanwari is the mountain lake of Sheshnag (3,574 m), after which, 13 kms away is the last stop, Panchtarni. The Amarnath cave is 6 kms away from there. During the month of July and August, an ice stalagmite forms a natural shivling in the Amarnath cave and is believed to be very much sacred. 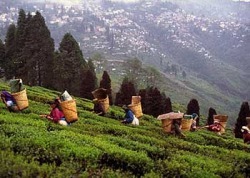 Darjeeling, known as the queen of the Himalayas is situated in the Northern Part of the Indian state of West Bengal. The city is located in the Siwalik Range of the lesser Himalayas and is famous for its tea industry. The city is also famous for the Darjeeling Himalayan Railways which is one among the UNESCO World Heritage List. There are a large number of tourist destinations in Darjeeling making this place a wonderful holidaying experience.To the east, a dull orange sun emerged painting the sky with brilliant strokes of magenta, gold, orange and fuchsia. The snow capped Everest, Kabru, Kanchenjunga, Jannu and other peaks slowly emerge from slumber to start a new day. The sun worshippers gasp at the magnificent sight. As the fog lifts in the slowly penetrating sun, the town gradually comes alive. Amidst brewing of tea, the sing-song Gorkhali which is the local dialect, rises and falls like music. Fast Facts Area 3149 square km Altitude 6710 feet Languages Hindi, Gorkha, Bengali, Nepali, Tibetian and English Best time to visit March to June and again from October to December STD Code 0354 google_protectAndRun("render_ads.js::google_render_ad", google_handleError, google_render_ad); Among the major tourist attractions in the Darjeeling city, the most important is the Tiger Hill. It is situated about 2590 m and gives a splendid of the sunrise over Kanchanjunga. Mount Everest, the world’s highest peak is clearly visible from the Tiger Hill. Another important place to visit in the city is the Rock Garden and Ganga Maya Park. These parks are located about 10 km from the town and have developed into wonderful picnic spot.